Furniture – can take up a lot of space, consider building in seating areas or buying foldaway items that can be stored away. Mixing Products – such as patio slabs, decking, planters, and decorative stones are great to create different zones in the garden. Make sure the colours are neutral and complement each other. Low maintenance – more patio and potted plants means minimum fuss with maximum impact. Perfect for the small garden. Colour – outdoor colour schemes are extremely important when it comes to small spaces. The key is to keep walls and flooring neutral and light but using vibrant flowers, features and soft furnishings to add depth and colour. Privacy – this is many homeowners biggest issue the feeling of being overlooked. Why not use cedar fence panels that look contemporary but are a great screen or pergolas strategically placed with climbers to create seclusion and privacy. 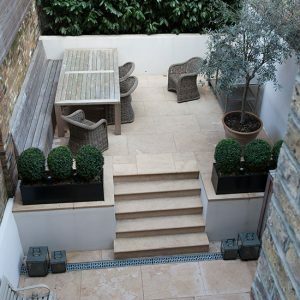 Consider a Garden Designer – to ensure you get the most out of the space. 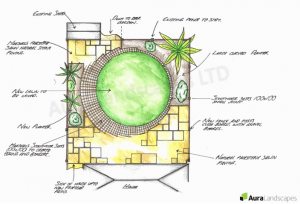 Garden designers can visualise your garden and advise on what products to use, colour schemes and overall how it will fit perfectly for your lifestyle. However be aware that garden designs are not cheap and neither is the build. But it can save many costly mistakes and if you want the overall garden to be great you may want to forget DIY and get the professionals in! 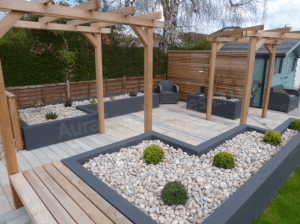 If you are looking for a professional garden design and build service then just call 02380 434231 to discuss your small garden project.